I have allowed myself to build the Divide 57d4. I want to run it on the Spectrum +2A. Components under the Rom are equipped. However, no joystick adapter. Back smd IC is equipped. Jumper for TK90X is closed. Gal's are the A, XM and XR. LEDs have the right type. It starts with a black and white striped image and some red blocks above, does not change even if the EP-Jumper is open. To make no mistake to the review, I have the same way the Divide 57d3 set up with completely new components. If someone has this hardware running, give me a hint what I did wrong. I do not have the special version for TK90X, leave the jumper open and try again, spectrum +2A isn't a (illegal) Brazilian Clone. And another very important question, please make a deep clean of expansion bus. It does not appear the mode to flash the eprom. Under the eeprom socket two diodes and a 10K resistor are required. But this image should help you. These versions d2,d3...d4 are special for brazilian clones TKs, for +2a works with less components. (please resize the caption) this message board do not fit the images. (please fit to page) or "save img as"
...version d4 are UNTESTED by the autor. Hope you find this info usefull. You do not get offended, because it is difficult to express myself in a language that I do not master to perfection. The author of the page is a very friendly and helpful person, write directly to him, who will be able to help him for sure. He has helped me with many doubts, I have always managed to fix the problems I had writing to him. I wrote to Velesoft a few days ago but still have no answer. Maybe he is on vacation but I have to wait. This 4K7 resistor is still a mystery to me (only for ZX without UVY pins). I searched again for errors on the boards but found none. How have you checked for errors? 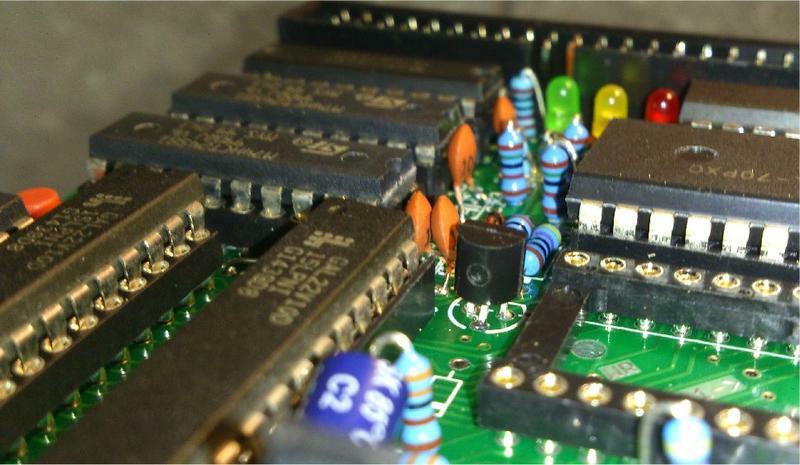 -check Z80 in +2A pcb, M1 line. -correct orientation of capacitors with polarity and transistors. 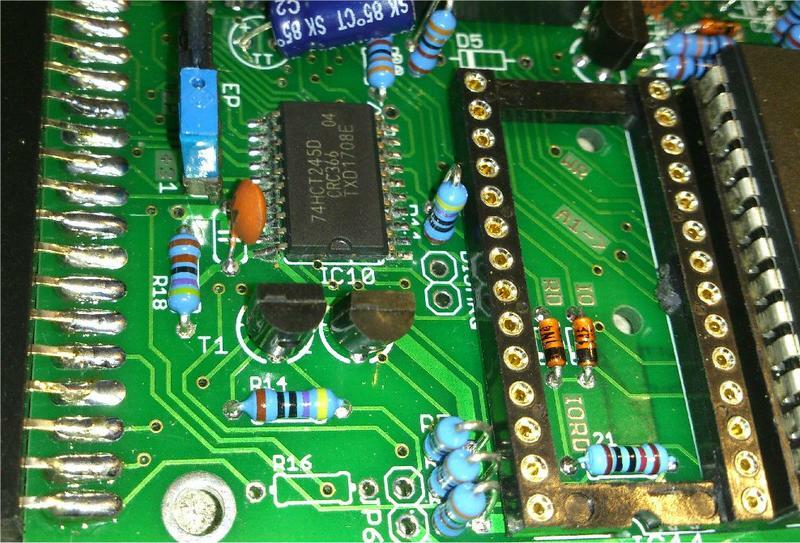 -remove trs and check transistors off pcb. -check and verify that jumper switchs really close the jumpers. use good jumper switchs. -Remove all the components in socket. 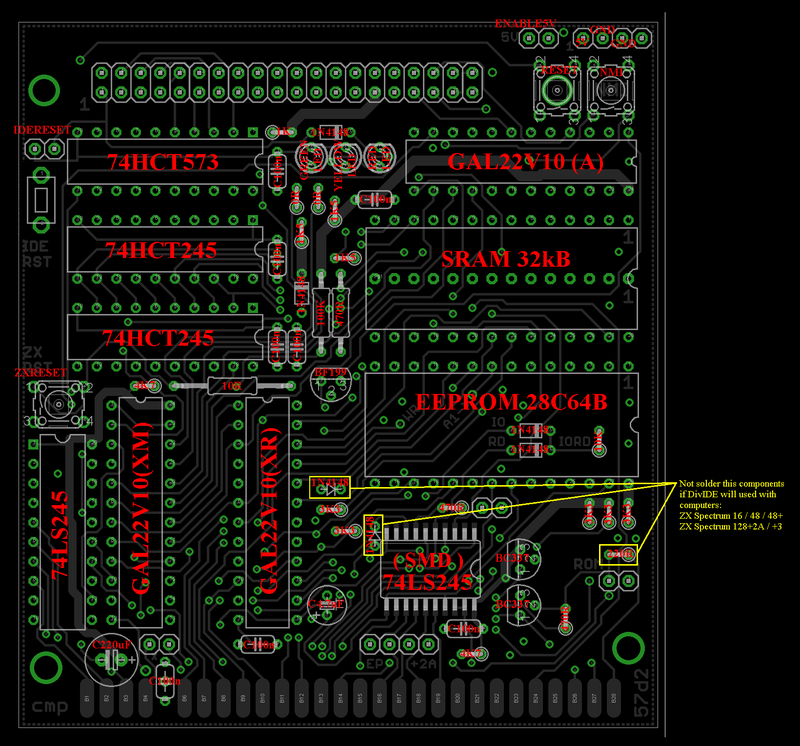 -check again TTL components off pcb. -use a programmed EPROM 2764 with standalone programmer off pcb and with permutor contents of TBIOS or EEPROM in 28c64 socket. -Deep cleaning with isopropyl alcohol of pcb. -Drying with compressed air of pcb. -Check the solder points for short circuits or poor solder in some places. -Check the solder points for short circuits. It is possible that the printed circuit board has a manufacturing error. I have now used all the needed parts of the 57d3 board for a 57c board and everything works right now. The gals of the 57d3 board were compared to a programmer, all ok.
A new board was used to recreate the 57d3 which does not work. 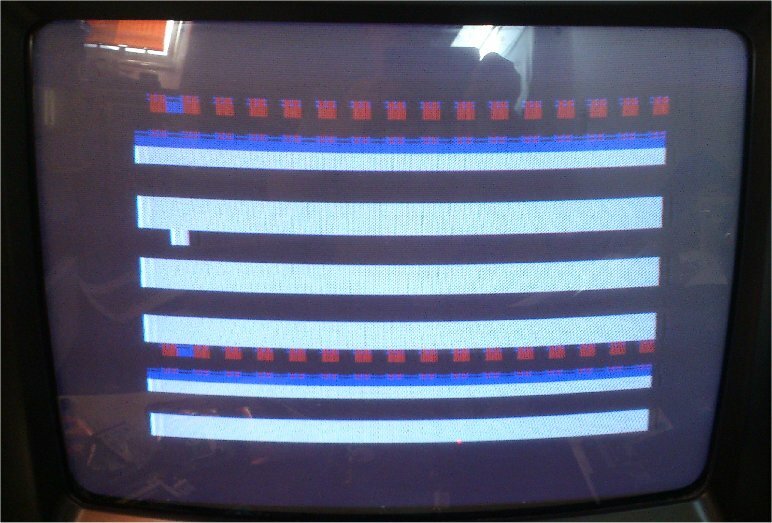 Unfortunately it turns out that this version 57d3 is not executable on the Spectrum +2a. As long as no one has a proof to the contrary I must warn against trying the replica of the 57d3 for a Spectrum +2a. The 57d4 will probably not work for the same reasons. Do not waste time and money on this design.